There has been a lot of talk in recent years about the effect pasture mycotoxins are having on our horses. While the extreme cases of staggers and pregnancy complications from grasses like perennial ryegrass and tall fescue are well documented it appears that pasture mycotoxins may be having more subtle effects on our horses that until recently have not been well recognised. In an attempt to reduce the impact of the mycotoxins present in pastures many horse owners have been using mycotoxin binders. But do they work? These possible symptoms are obviously very broad and many of them can be caused by any number of other factors, so you need to be very, very careful not to jump to conclusions and assume that the problems you are seeing in your horses are caused by mycotoxins in your pasture. if you have ruled out other possible causes and your horse is grazing a pasture that is potentially ‘poisoning’ them, then chances are what you are seeing is a mycotoxicosis. WHICH MYCOTOXINS ARE PRESENT IN PASTURE? Potentially, there could be any number of mycotoxins in your pasture as common moulds or fungi like Aspergillus, Fusarium and Penicillium can produce mycotoxins when growing on pasture. However, the mycotoxins most likely present in perennial ryegrass and tall fescue pastures that will cause issues are ergovaline and lolitrem B. A mycotoxin binder is a compound that can be added to a ration in an attempt to grab hold of a mycotoxin that may be present in feed or pasture, binding it strongly enough to prevent absorption from the gut of the animal. There are many materials that can be used as mycotoxin binders including activated carbon, aluminosilicates like zeolite, cellulose, polysaccharides that are found in the cell walls of yeast and some bacteria (eg glucomannans) and even some synthetic materials. One of the reasons some binders can bind some mycotoxins and not others is dependent on the mycotoxin itself and whether it is polar (possessing an electrical charge) or not. Aflatoxin for example is a polar mycotoxin and is very easily ‘picked up’ by a yeast derived glucomannan based binder (which are the most common mycotoxin binders on the market for horses). The pasture based mycotoxins ergovaline and lolitrem B on the other hand are non-polar (no charge) so trying to pick them up with a yeast cell wall based toxin binder is sort of like trying to pick up a piece of paper with a magnet … it just won’t work. WHERE DOES THAT LEAVE US WITH PASTURE MYCOTOXINS? Well… unfortunately there is very little research to show what may or may not work with regards to pasture toxins. None of the companies that manufacture or sell the yeast based binders have (from what I can see) ever released data to show their products are effective against lolitrem B and ergovaline in any animal species, let alone horses. Research at the University of Melbourne is showing promising results with a new toxin binder in reducing the impact of ergovaline and lolitrem B in sheep. This toxin binder as well as one or two others now on the market for the more common mycotoxins are a new type of ‘binder’ that combines the ability to bind mycotoxins with the ability to also break them down and deactivate them – presumably it is this double mode of action that is enabling them to be somewhat effective in reducing the impact of the endophyte toxins like ergovaline and lolitrem B. If you believe your horse is affected by pasture mycotoxins and you are using a mycotoxin binder it would be a good idea to contact the company you are buying the binder from and asking them what the binder is and whether they have data to show it actually binds the endophyte mycotoxins affecting your horse. If it is a yeast based binder it is unlikely to be reducing the effects of ergovaline and lolitrem B but you may still be seeing a positive effect if your other feed, hay or chaff is contaminated with one of the common mycotoxins that these yeast based binders are good at binding. Really the best way to reduce the impact of ergovaline and lolitrem B is to either remove the horses completely from the pasture, especially during late summer and autumn when endophyte mycotoxin levels are likely to peak. Alternatively, manage your pastures well by preventing both overgrazing and underutilisation of pasture (allowing pastures to go rank/long with many seed heads) so that the risk of ergovaline and lolitrem B ingestion is reduced. Providing mycotoxin free hay to reduce pasture intake will also help. This newsletter by Dr. Nerida Richards was originally posted to the FeedXL user forums for FeedXL subscribers in February, 2015. If you would like to be among the first to receive our newsletters then please consider becoming a FeedXL member or subscribing to our email list. https://feedxl.com/wp-content/uploads/2012/12/iStock_000010673967Small.jpg 565 849 Dr Nerida Richards https://feedxl.com/wp-content/uploads/2017/08/FeedXL-header-logo-300W.png Dr Nerida Richards2015-02-19 12:47:312019-04-09 01:10:52Mycotoxin Binders: Do They Work on Pasture Toxins? As the seasons change so does the amount of pasture available to your horse. 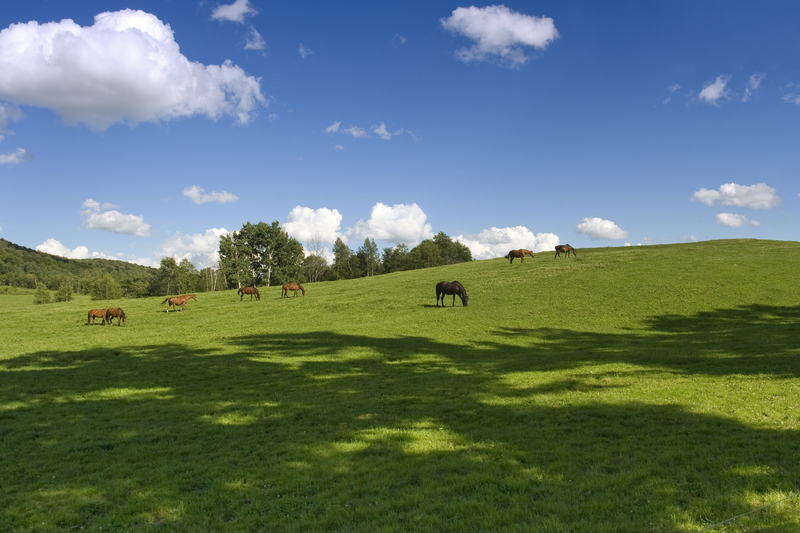 And as the amount of pasture changes, so does your horse’s need for supplementary feed. Failure to adjust your horse’s feeding regime correctly with changing seasons could result in an overweight, hyperactive horse or an underweight, tired mount. But is it as simple as just changing the amount of feed you are giving? We explore this in detail in the following article. As the amount and quality of pasture changes in your paddocks, so does the amount of digestible energy (calories) available to your horse. During winter or periods of drought when very little pasture is available, performance horses often need to be provided with additional energy in the form of hay, haylage, chaff and/or pelleted, extruded or sweetfeed concentrates to ensure their daily energy requirements are met. In the reverse, when large amounts of high quality pasture is available, the pasture alone can often go close to meeting a performance horse’s requirement for energy. When these high quality pastures are available, there is little to no need to feed additional hard feed. In the middle of those two extremes is a situation where either the quality or quantity of available pasture means additional hard feed or forages needs to be supplied to meet energy requirements. The table below shows the energy deficit left in a working horse’s diet when excellent, fair or poor quality pasture is the only feed provided in the diet. Excellent quality pasture is able to meet 100% of this horse’s energy requirement, while the poor quality pasture leaves a 26 MJ/day energy deficit. The key to knowing when to adjust the amount of feed you are feeding according to pasture conditions is regularly body condition scoring your horse to detect changes in body fatness and taking careful note of your horse’s behaviour (see FeedXL Newsletter #1). If your horse is starting to get too fat or is feeling full of itself this may indicate you are feeding too much. If your horse is losing condition or feeling flat during work pasture quality may have dropped and you may need to feed more supplementary feed. While adjusting the amount of extra feed you provide may seem simple and is something a majority of horse owners do instinctively very well, there is a catch … you need to adjust what you are feeding to control energy intake WITHOUT unbalancing your horse’s diet from a vitamin and mineral perspective. Let’s look at an example; A horse is grazing poor quality pasture and being supplemented with 2 kg/day (4.4 lb) of alfalfa/lucerne hay and 3 kg per day (6.6 lb) of a complete feed. As spring approaches and pasture conditions start to improve the horse starts to put on some weight so its owner (wisely) reduces the complete feed being fed from 3 kg/day to 1.5 kg/day (3.3 lb) and the horse’s weight stabilises. Once the warm weather arrives, the pastures improve to excellent quality and again the horse starts to put on some weight and feels a bit fresh in its work, so the complete feed and lucerne hay is now completely removed from the horse’s diet. This feed reduction strategy is perfect with respect to controlling energy intake and is absolutely what should happen to avoid an overweight, hyperactive horse. However, simply reducing the amount of a complete feed in a horse’s diet leaves that horse wide open to mineral deficiencies, because in reducing the amount of complete feed in the diet to control energy intake, you are also going to reduce the amount of supplementary minerals in the diet and create some mineral deficiencies. The table below demonstrates how these mineral deficiencies develop as the amount of complete feed in the diet is reduced. Obviously continuing to feed the same amount of complete feed all year round to meet mineral requirements is not a feasible solution as while this will prevent mineral deficiency, it will oversupply energy requirements when pasture conditions are good, causing horses to get overweight and hyperactive. So what should you do? The best solution is to always have a complete feed and a compatible low dose mineral supplement or balancer pellet on hand so that as you reduce the amount of complete feed to control energy intake you can add some supplement or balancer pellet to meet mineral requirements without adding unwanted calories to the diet. Adding the balancer pellet at different rates according to pasture conditions and the amount of complete feed being fed means you can control energy intake without causing a mineral deficiency. Of course, not all complete feeds and balancer pellets are created as equal, so use FeedXL (FeedXL.com) to work out which ones do actually meet all of your horse’s requirements. Also stick with products that fully disclose the nutrient analysis of the feed on the label so you can make informed choices on the best complete feeds and supplements to use for your horse. As seasons and pasture availability change so must your horse’s feed regime. In order to control your horse’s body condition and behaviour the amount of energy (calories) in the diet needs to be kept in check. To do this, the amount of supplementary feed you give will increase during times of poor quality pasture and in the reverse the amount you feed will need to be decreased when there is high quality pasture available. However, in adjusting feed amounts up and down to match pasture conditions, be aware of the diet’s mineral balance because controlling energy intake by reducing the amount of complete feed you are giving may be inadvertently causing mineral deficiencies that will affect your horse’s health. Feeding a complete feed, together with specific amounts of a mineral supplement or balancer pellet will allow you to control energy intake whilst always meeting mineral requirements. 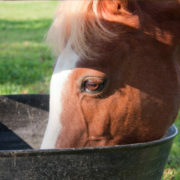 FeedXL.com can help you to work out which products are best to use for your horse and will show you when you are or are not meeting mineral requirements as you adjust amounts of feed in the diet. This newsletter by Dr. Nerida Richards was originally posted to the FeedXL user forums for FeedXL subscribers in July, 2014. If you would like to be among the first to receive our newsletters then please consider becoming a FeedXL member or subscribing to our email list. As temperatures warm up heading into spring or cool down heading into autumn you will start to notice your pastures changing as temperature and moisture conditions change. In spring you will usually see a rapid growth of lush pasture while in autumn, depending on the climate you may see a flush of growth similar to that of spring in warmer climates, or you may simply get a slower growth of lush pasture in cooler areas with possible early frosting. While this new growth is usually a welcome sight and means horses are able to return to or remain out on pasture, this new growth pasture can present some unique problems for horses. 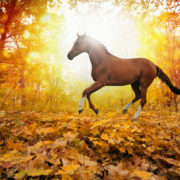 Spring and autumn are well known as ‘danger times’ for laminitis and it is not uncommon to find more horses with diarrhoea, behavioural problems and colic during these periods. 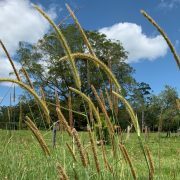 So what is it about pastures growing during these seasons that make them unique and how can they be managed? Lush spring and autumn pastures can contain as little as 15% dry matter meaning they are up to 85% water. Because of the extremely high water content of these pastures horses need to graze for long periods and eat large amount of pasture to ingest their required amount of 90% dry matter feed. For example a 500 kg horse grazing a 15% dry matter pasture would need to eat over 60 kg of this pasture in order to consume 10 kg of 90% dry matter feed (equivalent to 2% of bodyweight). If pasture quantity is low this is a major challenge for any horse and can result in horses doing poorly on lush new pastures, even though on a dry matter basis they are very high in digestible energy and crude protein. There is also very little fibre present in pastures during these early growth stages. Fibre that remains undigested to some extent as it passes the whole way through the digestive tract is important for the normal functioning of the gastrointestinal tract and the formation of manure. Horses that are not given an additional source of fibre when on lush young grass may experience diarrhoea and are at a higher risk of colic associated with a low gut fill. Grasses in the very early vegetative stages of growth can contain as much as 25 to 30% crude protein on a dry matter basis. While for most healthy horses this doesn’t present a problem, horses in very heavy work may find that the high crude protein level adds to their digestive heat load and will also increase urine production as the body works to rid itself of the excess nitrogen. In situations where water balance is important and water isn’t always readily available (for example in endurance horses during competition) the combination of more digestive heat and increased urination can lead to an increased risk of dehydration. Horses that are stabled overnight or during the day and allowed to graze the remainder of the time may also experience problems associated with these high levels of protein. 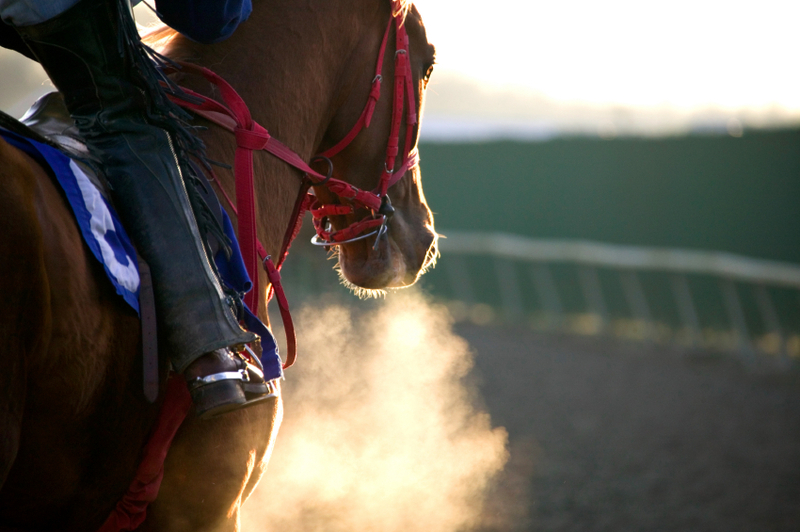 Excess protein causes the distinct ammonia smell often detectable when mucking out stables, which in poorly ventilated areas can cause respiratory problems for the horse. Rapidly growing pastures contain high levels of potassium and low levels of magnesium. While not proven in horses, excessive potassium can reduce the absorption of magnesium and increase magnesium excretion from the body in other animal species including humans. This reduced magnesium absorption, increased magnesium excretion and an already low level of magnesium in the pasture is thought to be causing chronic magnesium deficiency in horses. Young rapidly growing pastures can also contain high levels of nitrate which also increase magnesium excretion from the body. Other factors associated with some pastures including low levels of selenium and a high phytoestrogen content in clover dominant pastures can also exacerbate magnesium deficiency. Perhaps the condition that has received the most attention in association with spring and autumn pastures is laminitis. Green pastures use the process of photosynthesis to create non-structural carbohydrates (NSC) from sunshine, water and carbon dioxide. Under good growing conditions the plant uses these NSCs as fuel for its own growth. However if the plant is stressed in any way or subjected to temperatures too low for growth to occur over several days, these carbohydrates will continue to be produced and will accumulate in the plants leaf and stem tissue for later use. When horses with insulin resistance who are prone to laminitis graze these pastures with the high levels of accumulated NSC, laminitis can develop. Other characteristics of spring and autumn pastures may also increase the risk of laminitis for prone horses. For example, a study in cows and calves by Lentz et al (1976) found that high levels of potassium (infused as potassium chloride) caused significant elevations in plasma insulin and in the calves, this response was further exaggerated in magnesium deficient animals. So it is possible that the high potassium content of lush pastures coupled with an induced magnesium deficiency is causing laminitis by causing prolonged elevations of insulin, which presumably would be worse in insulin resistant animals. High levels of nitrate have also been suggested as a cause of laminitis in horses and dairy cattle, though the role of nitrates in laminitis is not clear. Pastures that are subjected to frosts or those that contain capeweed are of particular risk for nitrates, especially following application of nitrogen fertiliser. Provide your horses with a supplementary source of fibre in the form of hay, chaff or haylage. Give them access to free choice hay or provide them a meal of hay, chaff or haylage equivalent to at least 0.5% bodyweight (2.5 kg for a 500 kg horse) every 24 hours. This amount should be increased if pasture availability is limited. The extra fibre in these feeds will improve gut fill and manure consistency reducing the risk of colic and diarrhoea and also help your horse to consume the calories he needs when pasture water content is very high. If high protein intake is an issue, provide your horse with a meal of lower protein grass or meadow hay or chaff before being turned out onto pasture. You may also need to restrict your horse’s pasture intake by using a grazing muzzle, strip grazing or extending the period of time your horse is kept off pasture with access to lower protein hay. Have your spring or autumn pasture tested for mineral content and use this information together with FeedXL to rebalance any potassium and magnesium imbalance. Care must also be taken to provide enough salt to meet sodium requirements as a sodium deficiency reportedly increases the likelihood of a magnesium deficiency in some horses. Manage grazing times to reduce the risk of laminitis. If NSCs are suspected as causing issues for your horse you should restrict grazing to only the very early hours of the morning, removing the at risk horse from pasture by 11 am. If nitrates are suspected (for example on capeweed infested pastures) horses should only be allowed to graze in the late afternoon and into the early evening. A grazing muzzle can be used at any time to reduce pasture intake while allowing the horse to move freely around the pasture. If a muzzle is used for limited periods of grazing, care must be taken to provide additional forage in the form of hay or haylage to ensure minimum forage requirements are met. FeedXL will help you to calculate your horse’s minimum forage requirement and how much additional forage must be fed each day in order to meet the minimum requirement. Don’t overgraze your pasture. Pastures that are constantly very short and in the early stages of growth are the ones that are highest in potassium and nitrates and lowest in fibre and magnesium. Use good grazing management and rotational grazing strategies to allow pastures to stay at a healthy height and stage of growth. As a general rule of thumb don’t graze your pastures until they are at least 6 inches (15 cms) in height and then allow your horses to take half of the pasture and leave the other half there to photosynthesise and provide fuel for further pasture growth. 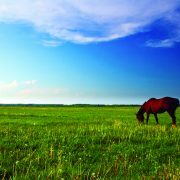 Spring pastures are a valuable source of nutrients for your horse and managed correctly they can be fed without any issues. But to know exactly what you are dealing with and to allow you to correctly balance your horse’s diet to avoid problems you should have your pasture tested to assess energy, protein, nitrate, NSC and mineral levels (a sample should be taken in the late afternoon for the NSC analysis and in the early morning for the nitrate analysis). Armed with a full analysis you can then use this information together with veterinary advice and a ration analysis from FeedXL that uses your pasture analysis data to come up with a ration and a feeding strategy that will lessen the risk of any problems occurring. As they say, information is power and knowing exactly what you are dealing with in your spring and autumn pastures is no exception. We recommend the following pasture analysis laboratories: Equi-Analytical, USA (http://www.equi-analytical.com/); Symbio Alliance, Australia (http://symbioalliance.com.au/) and Hills Laboratories, New Zealand (http://www.hill-laboratories.com/page/pageid/2145845711). This newsletter by Dr. Nerida Richards was originally posted to the FeedXL user forums for FeedXL subscribers in May, 2013. If you would like to be among the first to receive our newsletters then please consider becoming a FeedXL member or subscribing to our email list. 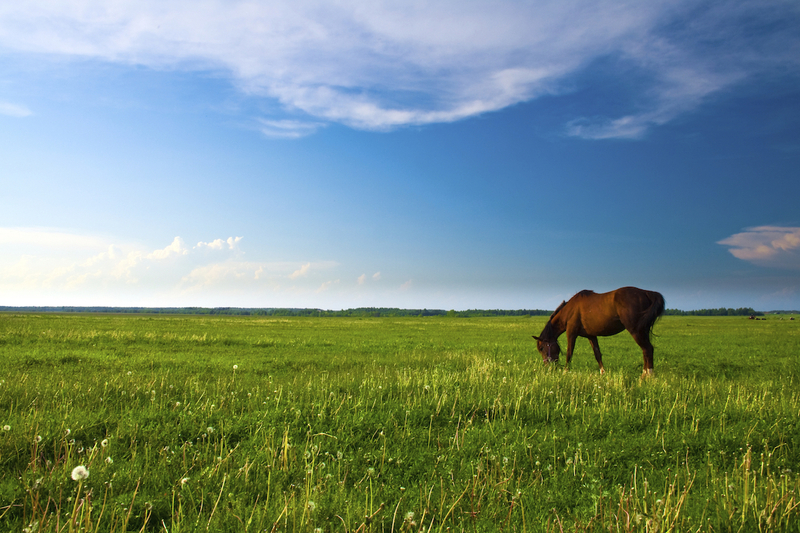 Is Pasture Affecting Your Horse’s Behaviour? During times of the year when pasture is young, lush, very green and growing quickly it is common to find horse owners having problems with their horse and particularly their behaviour. 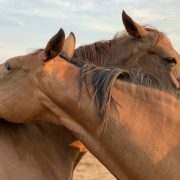 Normally quiet, calm horses can become ‘spooky’, behave erratically and become excited easily, show signs of incoordination, muscle tenseness, soreness or twitching and in severe cases may become dangerously aggressive and exhibit unusual herding behaviour. Until recently, the spookiness and excitability was often assumed to be due to the high energy content of the lush grasses. This may indeed still be a contributor, but when looking at all of the symptoms together it becomes clear that another underlying problem exists. The problem is, it is not very clear what this underlying issue is. Magnesium deficiency has been proposed several times, but most horse nutrition texts give no reference to pasture having the ability to cause a magnesium deficiency, much less that magnesium deficiency is capable of causing all of the symptoms seen. While this is a topic that one could easily spend years researching without answering many of the questions we now have, the following is my take on pasture induced magnesium deficiency and how it may be affecting your horse. Can a magnesium deficiency really cause all of these problems? The NRC 2007 publication reports that magnesium deficiency may cause ‘nervousness, muscle tremors and ataxia (incoordination), with the potential for collapse, hyperpnea (deep breathing) and death’. It goes on to say that ‘while uncommon, tetany in transported horses has been attributed to hypocalcaemia and potentially hypomagnesemia’. The NRC 1989 publication also stated that ‘pastures that are conducive to magnesium deficiency, tetany and death in ruminants do not affect horses similarly’. It then goes on to say that ‘no evidence was found in the literature to support this claim’. I am pointing this out only to demonstrate how little is known about this condition in horses. On reading this information about magnesium it would be easy to assume that a pasture induced magnesium deficiency in horses would be a rare occurrence. 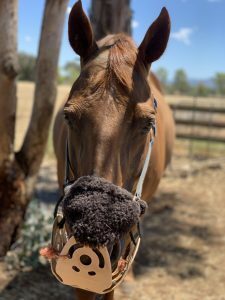 The fact is, many horse people are reporting strange behaviour in horses during the times of year pasture is young, green, lush and rapidly growing so something is going on. With such little information available in horses on magnesium deficiency, we must again look to other animal species for clues. It is quite well documented in ruminant animals that during phases of grass tetany (magnesium deficiency, most commonly seen in high producing dairy cows during early lactation grazing lush pastures) that affected animals are nervous with an overly alert appearance, they may lose coordination and ‘stagger’ and they may also become aggressive. Humans are also reported to suffer with cramps and muscle weakness as well as become confused, delusional, disoriented, suffer hallucinations and become aggressive during periods of magnesium deficiency. Hypocalcaemia (low plasma calcium) is also frequently observed in both humans and ruminants with magnesium deficiency. So while we don’t have direct, documented evidence in horses (yet), certainly the symptoms we are seeing in horses relate well to symptoms seen in other animal species under conditions of magnesium deficiency. The Science – why are these symptoms present? OK, so here we go with some of the underlying science to these problems that will help to explain why a magnesium deficiency can cause the symptoms seen in horses. Magnesium is essential for the functioning of a magnesium dependent enzyme called acetylcholine esterase. Acetylcholine esterase is needed for the breakdown of the neurotransmitter acetylcholine. During periods of magnesium deficiency, acetylcholine esterase does not function as it should and acetylcholine accumulates at the motor end plates causing neuromuscular excitability. This accumulation of acetylcholine is likely to contribute to the tense muscles, incoordination, muscle twitches and spookiness seen in magnesium deficient animals. Magnesium is also needed for the adenyl cyclase enzyme which is involved in the action of parathyroid hormone. This compromised function of the parathyroid hormone (PTH) is thought to be the main cause of hypocalcemia which is commonly observed in magnesium deficient animal species including ruminants, humans and rats as PTH is needed for calcium absorption. PTH is also needed for magnesium absorption so magnesium deficiency predisposes an animal to a more severe magnesium deficiency by altering the function of the hormone needed for its absorption. Magnesium is required for the phosphorylation of vitamin B1 (thiamine) into the biologically active thiamine pyrophosphate, so in effect a magnesium deficiency will cause a vitamin B1 deficiency, even when there is ample vitamin B1 in the diet. In humans, a vitamin B1 deficiency can cause confusion, and disorientation with sufferers reportedly becoming delusional and even hallucinating (maybe your horse really does see goblins hiding behind the tree!). Vitamin B1 deficiency can also lead to aggression. In horses, vitamin B1 deficiency is known to cause loss of appetite, incoordination, muscle twitching, tremors or stiffness, overflexing of the hindlegs, unnatural extension of the forelegs and hypothermia (low temperature) of the bodies extremities like the legs, muzzle and ears. Thiamine deficiency may also result in missed heart beats and lactate accumulation in the muscles. Finally a magnesium deficiency affects nitric oxide production by motor neurons. In situations of low extracellular nitric oxide but high intracellular nitric oxide in humans, aggression can result. This by no means is a complete review of how a magnesium deficiency may affect horses and again it is a subject I would need to research for years to fully understand (as there is some serious biochemistry involved). This mini review should however serve to demonstrate that should a magnesium deficiency occur, it is certainly capable of producing the varied symptoms being observed in horses by their owners. So, now that we know a magnesium deficiency could be the root cause of the unusual symptoms and behaviours observed in horses grazing lush, green and rapidly growing pastures, let’s look at what it is about these pastures that can cause a magnesium deficiency. Lush, young, rapidly growing pastures are well known to have high potassium and low magnesium levels. While direct evidence for horses is not available to my knowledge, in ruminant animals it is well known that excessive potassium can reduce the absorption of magnesium from the rumen. High dietary potassium is also reported to reduce magnesium absorption in humans. While it is only through extrapolating from data in other animal species, it is likely that excessive potassium in the equine diet also reduces the absorption of magnesium in horses. This reduced absorption, coupled with an already low magnesium concentration in the diet could possibly result in an induced magnesium deficiency, even if there appears to be enough magnesium in the diet to meet requirements. The acid base balance of the body can also affect parathyroid hormone (PTH) release, with an alkaline body pH, which commonly occurs on high potassium diets, suppressing the release of PTH in some animal species … so maybe this is also playing a role … and maybe even supplementing magnesium help as the horse may not be able to absorb it due to low PTH levels. Other dietary factors than can reduce magnesium deficiency include excess calcium (high dietary calcium reduces parathyroid hormone (PTH) release. As discussed above, PTH is needed for magnesium absorption), excess phosphorus (phosphorus can block the absorption of magnesium as it can calcium) or a vitamin D deficiency (also needed for magnesium absorption), vitamin B1 deficiency (affects magnesium absorption by altering the pH environment of the stomach) or vitamin B6 deficiency. High dietary potassium in lush green pastures not only reduces magnesium absorption in animals, but it can also increase the amount of magnesium excreted from the body, giving it a ‘double-whammy’ effect in causing magnesium deficiency. In addition, under the right environmental conditions lush green pastures can also have large amounts of nitrate accumulated in their leaves, especially when plants are very young and in the one or two leaf stage. In order to remove nitrate from the body, ruminants and horses bond the nitrate to a cation (a positively charged ion which includes calcium, magnesium, sodium and potassium) to form an ionic complex which is then excreted. Professor T.W. Swerczek, a researcher with the Department of Veterinary Science at the University of Kentucky, USA has reported that when a sodium deficiency exists (which is common in grass based pastures) nitrate is more likely to bond with calcium or magnesium, so under high nitrate conditions, a magnesium deficiency can occur. Other factors that may increase magnesium excretion from the body include excess oestrogen (possibly putting mare’s or horses grazing estrogenic forages like some clovers at higher risk) and a dietary selenium deficiency (again this is not confirmed in horses but is taken from human data). So with the combination of factors that reduce magnesium absorption and increase magnesium excretion from the body, a magnesium deficiency is certainly possible under the right conditions for horses grazing lush, green, rapidly growing pastures. Do endophyte mycotoxins play a role? They certainly could, though they need not be present for the symptoms of magnesium deficiency to appear. Ryegrass and fescue pastures that are infected with endophyte fungi may be more likely to contain higher concentrations of the problematic mycotoxins under high pasture potassium conditions (Swerczek 2003). Knowing whether or not they are involved is however going to be tricky as many of the symptoms of endophyte mycotoxicosis are very similar to those that could be caused by magnesium deficiency. Mycotoxicosis is however reported to be most likely when pastures are grazed down to the ground or when they are tall and rank, so it is less likely when the pastures are green, lush and growing rapidly. 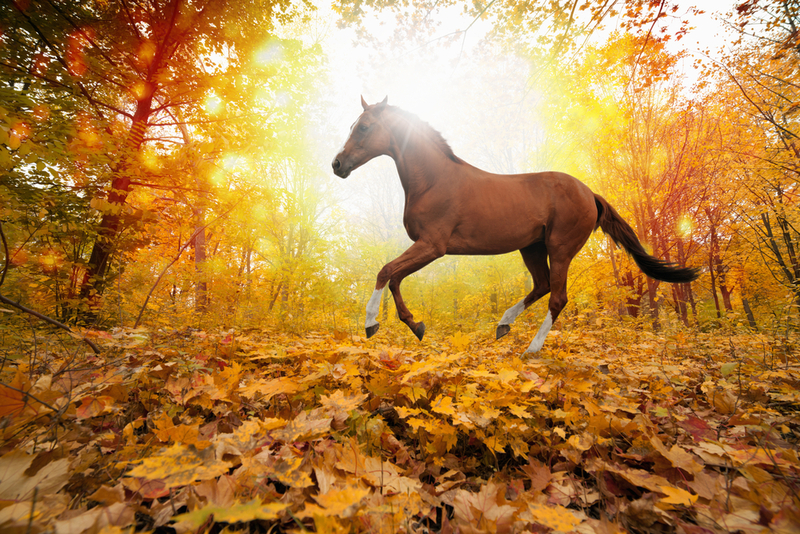 Laminitis is often seen in horses during spring and autumn seasons when pastures are green, lush and growing rapidly. It is now known that insulin resistance and high levels of circulating insulin are the most likely cause for most pasture based cases of laminitis and this certainly does help to explain most cases. However, rapidly growing pastures and particularly rapidly growing pastures in warmer climates are unlikely to have large amounts of accumulated sugars and starches and yet laminitis can still be found on these pastures. So if it isn’t sugar and starch causing the laminitis, what is? Insulin is used as a signal to cells to take in potassium from the blood. A really interesting study in cows and calves by Lentz et al (1976) found that high levels of potassium (infused as potassium chloride) caused significant elevations in plasma insulin and in the calves, this response was further exaggerated in magnesium deficient animals. So it is quite possible that the high potassium content of lush pastures coupled with an induced magnesium deficiency is causing laminitis by causing prolonged elevations of insulin, which presumably would be worse in insulin resistant animals. This would certainly make a very worthy avenue of research. It is also possible that the high nitrate levels that can accumulate under the right environmental conditions in young, lush, green pastures leads to laminitis. There is gathering anecdotal evidence to support this theory but as yet no science to actually prove it. Further, research by Paolisso et al, published in the American Journal of Clinical Nutrition (1992) showed that administering magnesium to elderly patients at a rate of 4.5 g/day improved their glucose handling and insulin sensitivity. This finding begs the question of whether a transient magnesium deficiency that may occur in horses when grazing rapidly growing spring or autumn pastures increases the risk of laminitis for already insulin resistant horses during these periods by exacerbating their insulin resistant status. Seek veterinary advice if your horse is showing symptoms – magnesium deficiency to the point where an animal is showing symptoms is a serious medical condition and you should always consult your veterinarian for advice. Your horse may be deficient to the point where magnesium and calcium need to be administered parenterally to restore blood levels back to a point that will alleviate the most severe symptoms and also allow magnesium and calcium to be absorbed from the gastrointestinal tract again (as very low magnesium levels turn down parathyroid hormone levels which then reduces magnesium and calcium absorption). It may be a good idea to discuss testing your horse’s level of parathyroid hormone as part of your vets overall assessment of your horse’s condition. Remove animals from problem pasture – if it is possible you should remove your horse from the problem pasture as soon as any signs are evident. Or if you know your pastures are problematic at certain times of the year, plan in advance and have them off the pastures before the symptoms appear. If you are unable to remove your horse from the pasture completely you should somehow try to restrict intake of the pasture by using a grazing muzzle during certain periods of the day (if laminitis due to sugars isn’t a concern then muzzling overnight and early in the morning is suggested as this is when nitrate levels are highest) or by strip grazing the pasture in small amounts each day and providing a low potassium forage like a mature grass/meadow hay. Use a low potassium forage as the base of the diet – mature grass hay will provide you with a lower potassium alternative to the lush pasture. 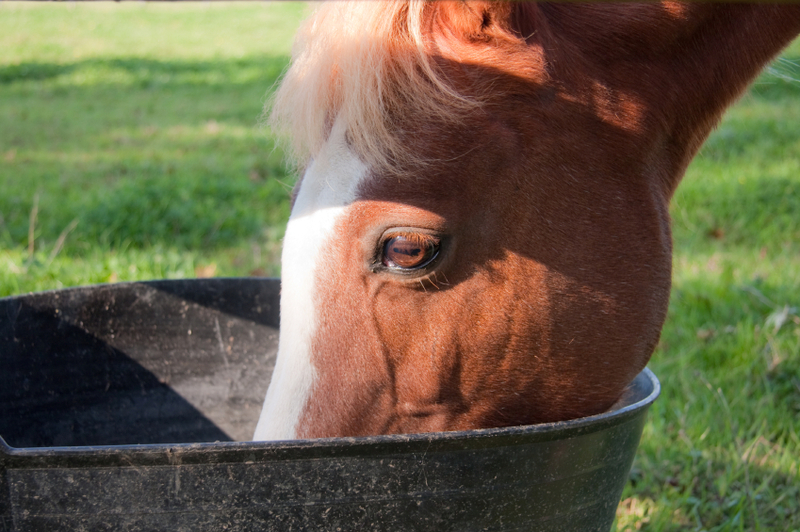 If your horse is already suffering symptoms you should also soak the hay for 30 minutes to remove as much potassium from the diet as you can. Supplement with magnesium, calcium, sodium and vitamin B1 – This is where it gets tricky as while we know you should supplement with these nutrients it is hard to say how much more you should add to the diet. Luckily though, all of these nutrients have a wide safety margin so we are afforded a nice big safety net. For a horse suffering with symptoms of magnesium deficiency, I would provide the following: Magnesium, sodium and vitamin B1 – an additional 100% of the recommended daily intake for your horse. Calcium – in theory, once you have corrected the magnesium deficiency and get the parathyroid hormone functioning as it should again you shouldn’t need to add additional calcium to the diet if the amount in the diet is already adequate. However, if your calcium to magnesium ratio in the diet is less than 2 parts calcium to one part magnesium on addition of the extra magnesium you should add enough calcium to bring this ratio back up to 2: 1. Correct any deficiency of vitamin B6 and selenium that may exist in the diet – A deficiency of these nutrients leads to reduced magnesium absorption and increased magnesium excretion so it makes sense to ensure your horse’s requirements are met according to the FeedXL recommended daily intakes for these nutrients. Avoid pastures, feeds and conserved forages that may contain oestrogens – Excess oestrogen reportedly increases magnesium excretion from the body so it would make sense to keep the dietary intake of plant derived phytoestrogens to a minimum during high risk periods of pasture induced magnesium deficiency. This includes avoiding clover, alfalfa/lucerne and feeds that contain soybean or soybean meal. These feed ingredients also tend to contain large amounts of potassium so avoiding them provides a double benefit (please note though that under normal circumstances all of these ingredients can play a valuable role in a horses diet so don’t go overboard in avoiding them all the time). PLEASE don’t ride your horse – if your horse is showing symptoms of magnesium deficiency please don’t try to ride. Your horse in this condition is both physically and mentally unstable and trying to ride would be the safety equivalent of getting into a car with a seriously drunk person and going for a drive – it really isn’t worth the risk and it won’t be enjoyable for you or your horse. Having seen some severe cases over the last few years there is no doubting that this condition exists, but as yet it isn’t recognised in nutrition texts. While it may seem like a simple matter of adding extra magnesium to the diet to correct the issue it isn’t that easy as the various factors discussed above may be contributing to low magnesium absorption or high magnesium excretion rates. If your horse is exhibiting these symptoms or other unusual behaviour that you think may be linked to your pasture you should have your pasture analysed to determine mineral levels you are working with and work closely with your vet and FeedXL to get your horse’s diet rebalanced and your horse’s magnesium levels restored. A short addition will be made to this newsletter in the coming weeks outlining an ‘action plan’ for affected horses and reviewing the various magnesium sources available. This newsletter by Dr. Nerida Richards was originally posted to the FeedXL user forums for FeedXL subscribers in March, 2013. If you would like to be among the first to receive our newsletters then please consider becoming a FeedXL member or subscribing to our email list. 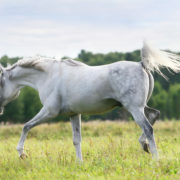 https://feedxl.com/wp-content/uploads/2013/03/Fotolia_17243686_XL-arabian-e1511594539977.jpg 681 1000 Dr Nerida Richards https://feedxl.com/wp-content/uploads/2017/08/FeedXL-header-logo-300W.png Dr Nerida Richards2013-03-10 14:02:462019-03-02 06:30:08Pasture: Is it Affecting Behaviour? Following on from Newsletter Number 24 that looked at how to identify grasses that could cause mycotoxin problems for horses, this newsletter will help you to identify grasses that have the potential to cause Nutritional Secondary Hyperparathyroidism, also known as ‘Bighead Disease’. Bighead Disease is a severe calcium deficiency and one way it can be caused is by grazing subtropical or C4-type pastures without appropriate calcium supplementation (for more on Bighead, read FeedXL Newsletter # 25 – Bighead). Subtropical or C4-Type pastures like kikuyu, bermuda grass (couch grass), buffel grass, setaria, green panic, pangola grass, guinea grass, purple pigeon grass, para grass and signal grass contain a compound known as oxalate. The oxalate in the grass binds most of the calcium available in the grass making it unavailable for absorption when the horse eats it. 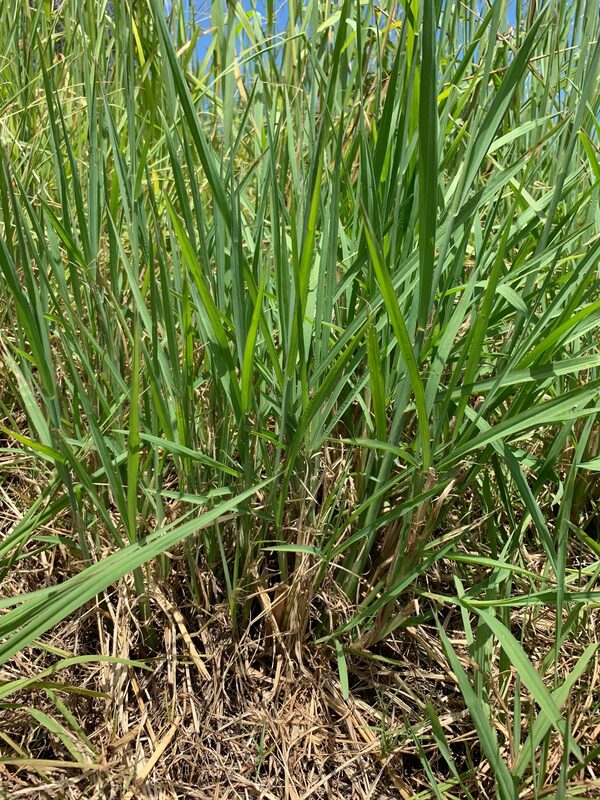 So even though these grasses may contain plenty of calcium, horses cannot access it, meaning over time they will develop a severe calcium deficiency. The oxalate appears to also bind some of the calcium coming from other feed ingredients in the diet, rendering it useless to the horse as well. The more oxalate the pasture contains, the more rapidly a horse will develop bighead. 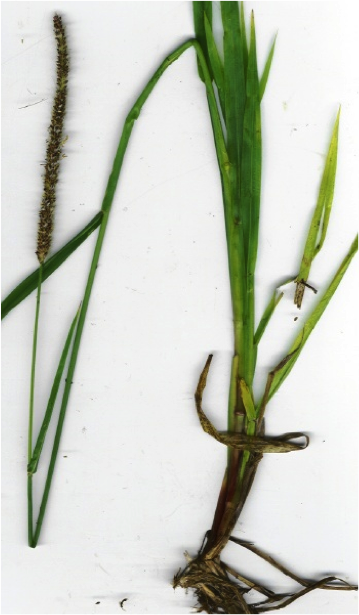 Setaria, and specifically Kuzungula Setaria is the most dangerous high oxalate grass for horses, with severe bighead appearing in horses grazed on this grass species within one to 3 months. Where do these grasses grow? Bighead Disease caused by pasture has traditionally been thought of as a disease of the subtropics and tropics as this is where the high oxalate pastures were first introduced for grazing cattle (cattle don’t experience the problem as the bacteria in their rumen are able to break the oxalate/calcium compound so they can absorb the calcium). 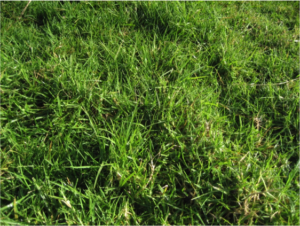 However, some of the grass species that readily cause Bighead, like Kikuyu and Bermuda Grass, can grow in a wide range of environments and due to their popularity as a hardy lawn species, they are spread well into temperate climate areas. So don’t be complacent about Bighead Disease, even if you live in a temperate environment. The grasses that can cause this disease are widespread. Being able to identify them is important! Use this newsletter to have a wander around your paddocks to see if any of the 4 most common problem species are in your pasture. 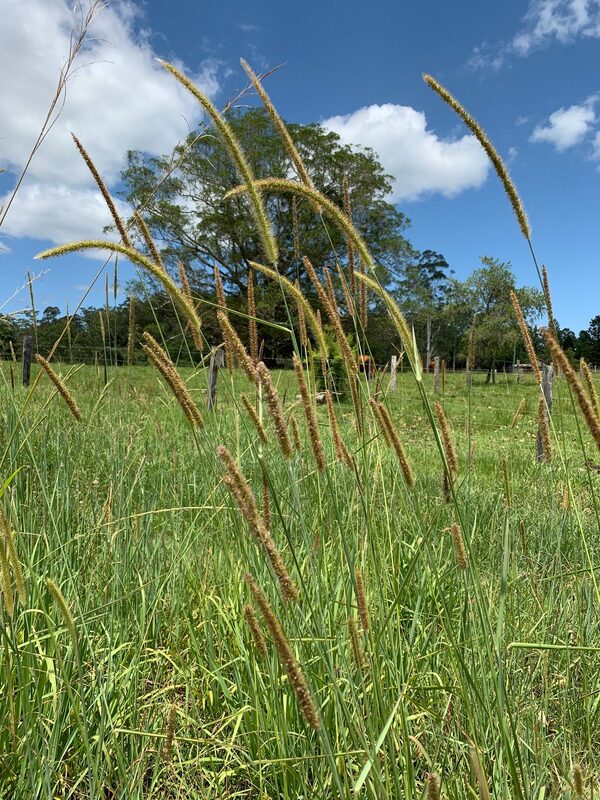 Now it is time for you to look at some grasses to see if you have any of the 4 most common pasture species that may cause Bighead lurking in your paddocks. Use the information in FeedXL Newsletter #24 – Identifying Pastures Part 1 as your plant physiology reference guide (you can find this here). Leaves are light to bright green and moderately hairy on top and underneath. Leaf tip is slightly keeled, though leave flatten as they get older. Grows using both underground rhizomes and vigorous over ground stolons (so it has an obvious matt of runners above ground). Kikuyu does not get visible seed heads but at flowering time, long, white, thread like stamens will sometimes be visible. The leaf sheath of kikuyu (where the new leaves emerge from) is pale and light green in colour, turning brown as the grass matures. It is obviously hairy. These images show kikuyu when it is green and growing and also almost completely dried off. Note the distinctive almost lime green colour of the grass when it is green and the dense, thick matt of stolons once it has dried off. The seed/flowerheads are a digitate panicle with 3 to 7 thin branches 2 to 6 cm long. Leaves have a prominent mid vein with many smaller veins running in parallel. Leaves are relatively short, green and hairless to sparsely hairy with more hairs underneath. Ligules are short hairs on a membranous rim with a tuft of longer hairs on each end. 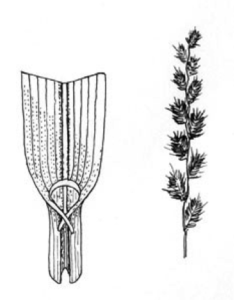 Grows using both underground rhizomes and over ground stolons (so it has visible runners above ground, but they are not nearly as thick as seen with klikuyu). The seed head is cylindrical (like a small bottle brush) and can be straw, grey or purple in colour. Leaves are flat, hairless except for some sparse long hairs near the sheath and green to blue in colour. Leaf edges are rough and tip is flat. Grows in a tussocky or bunch growth habit but it can sometime have stolons and rhizomes. Spike like, panicle seed head that can be 8 – 25 cm long and varying in colour from purplish brown to brown to orange tinged. Leaves are broad, flat, grey-green in colour and generally hairless. Grows in a dense tussock with short underground rhizomes. 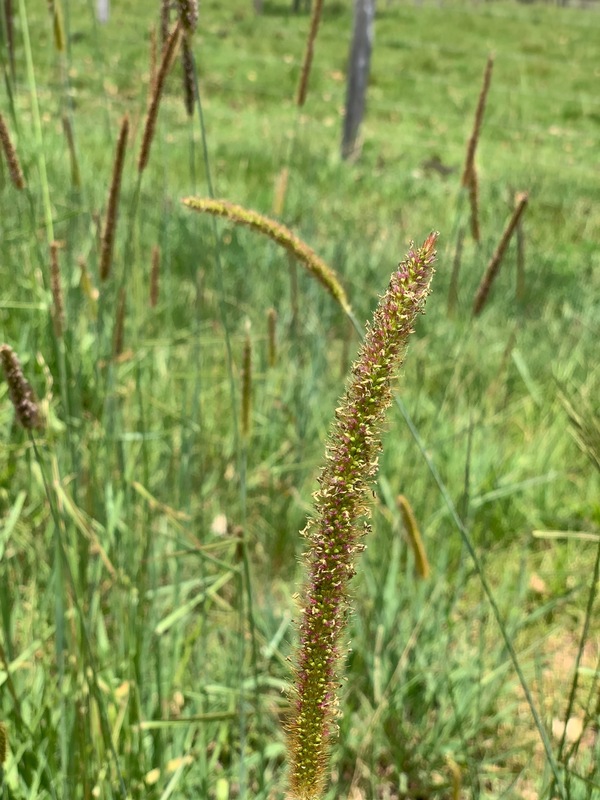 If you think you have these pastures but aren’t 100% sure, pot some of the plants you suspect are Buffel or Setaria and let them grow and go to seed. The seed head will help you to positively identify the species. 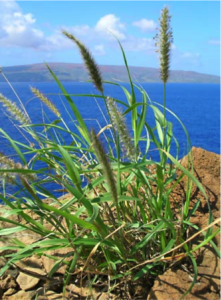 So you have these grasses … what now? 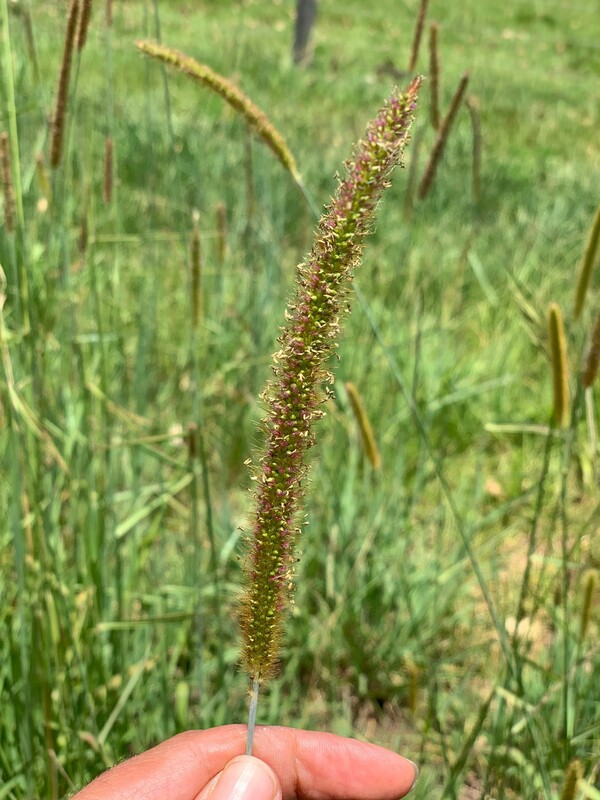 If you have accurately identified that Kikuyu, Bermuda Grass/Couch Grass, Buffel Grass or Setaria are present in your pasture, you will need to take this into account in your horse’s diets in FeedXL. First of all, determine what percentage of the pasture each of the species comprises, and then use the Advanced Pasture Builder feature to create a pasture that is comprised of these pasture types. 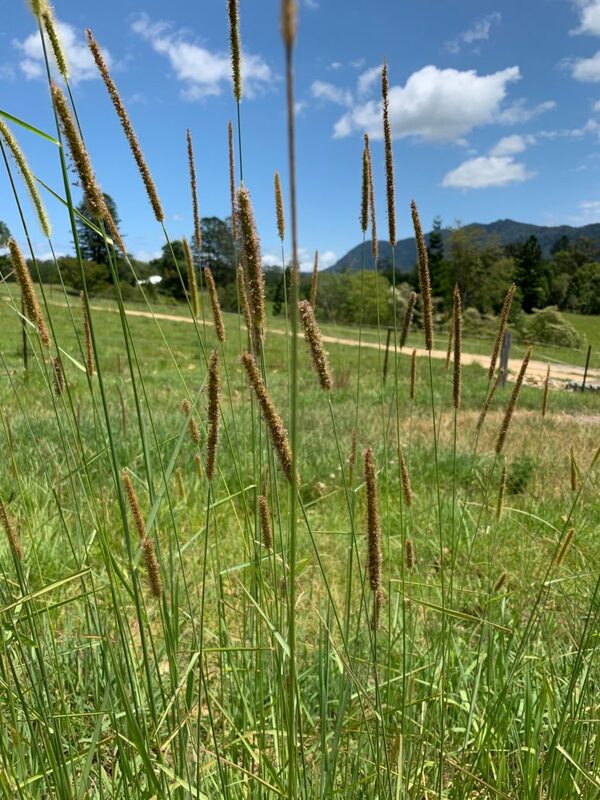 For example, if your pasture is 25% Kikuyu, 10% Setaria and 65% native grasses, use the Pasture Builder in FeedXL to create a pasture that is ‘C4-Type Grass – 25%, Setaria – 10%; and Native Grass – 65%. It is important to be accurate so FeedXL can calculate an accurate calcium to oxalate ratio for you and keep your horse out of harms way! Once FeedXL knows these pastures are present in your diet it will warn you if the calcium to oxalate ratio of the diet is too low, putting your horses at risk of bighead, and guide you in adding additional calcium to achieve the minimum ratio required of 0.5 parts calcium to 1 part oxalate. For more information on this, please read FeedXL Newsletter # 25 – Bighead. Diagrams and photos are from Penn State College of Agricultural Sciences http://cropsoil.psu.edu/, the American Lawns website http://www.american-lawns.com/, Plants of Hawaii website http://www.hear.org/ and the Informed Farmers website http://informedfarmers.com/. This newsletter by Dr. Nerida Richards was originally posted to the FeedXL user forums for FeedXL subscribers in January, 2011. If you would like to be among the first to receive our newsletters then please consider becoming a FeedXL member or subscribing to our email list. Pasture is an ideal feed base for any horse’s diet. It is an economical feed ingredient that provides an excellent source of energy, protein, vitamins and some minerals. Added to this is the benefit of the physical and mental stimulation grazing provides. Horses are born to graze. 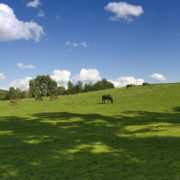 However, some pastures can cause serious problems for horses. In Part 1 of this series, we will look at pasture plants that can cause endophyte toxicity. 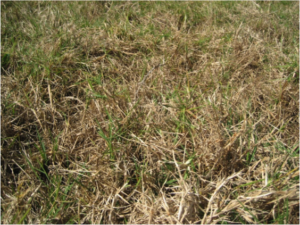 The two most common pasture species that can lead to endophyte toxicity are ryegrass and tall fescue. Some species of ryegrass and tall fescue are inoculated deliberately or infected with wild endophyte fungi. The fungi then live within the plant in a symbiotic relationship where the plant provides the fungi with food and a place to live and the fungi provide the plant with protection from insect and nematode attack by producing mycotoxins. 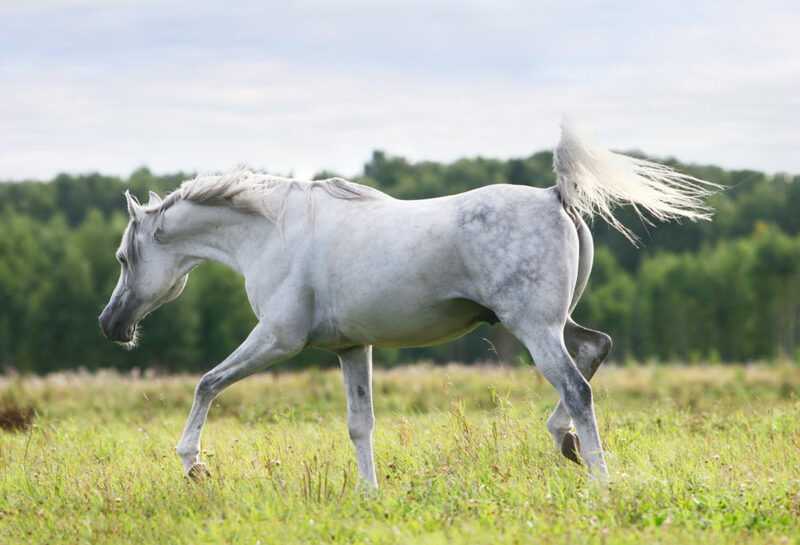 These possible symptoms are obviously very broad and many of them can be caused by any number of other factors, so you need to be very, very careful not to jump to conclusions and assume that the problems you are seeing in your horses are being caused by your pasture. 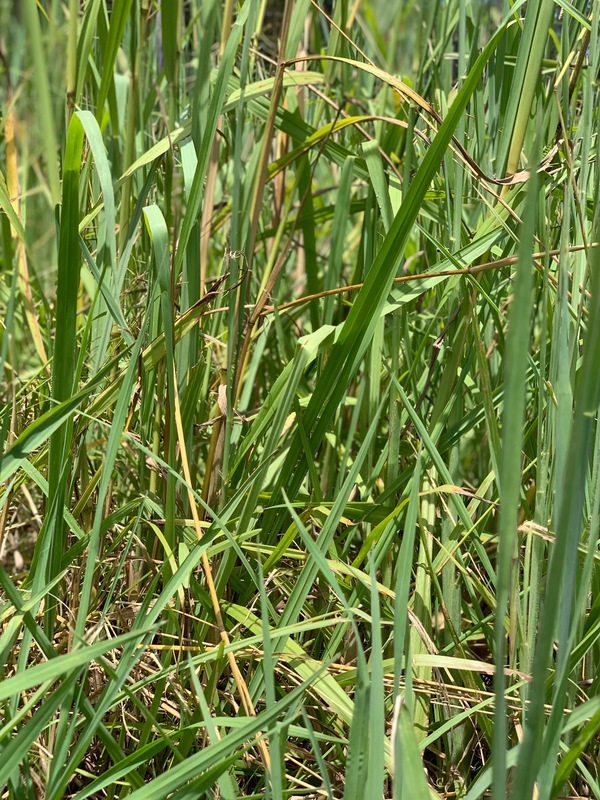 If you are observing these symptoms in your horses, the first step to knowing if they are caused by the pasture is to identify the pasture plants in your pasture sward to see if ryegrass and/or tall fescue are present. 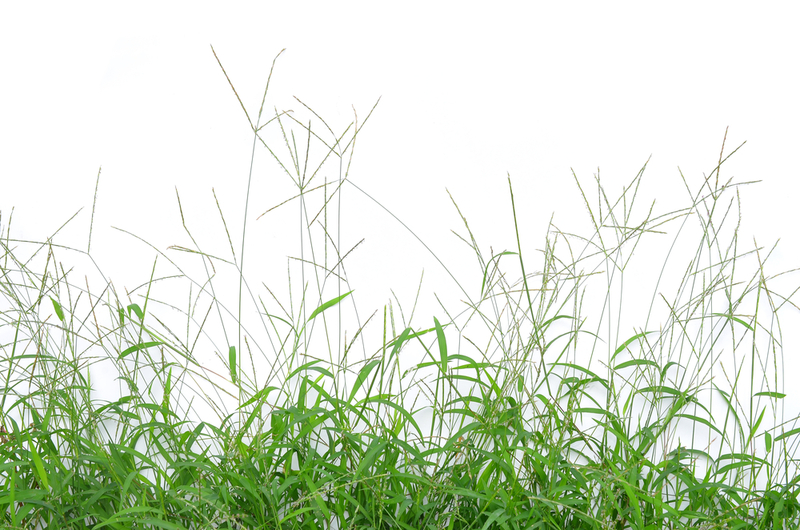 If these grasses are not present, you need to look for other causes of the problems you are seeing. The easiest way to identify certain plants is by finding their seed heads as grasses tend to have distinctive seed heads. 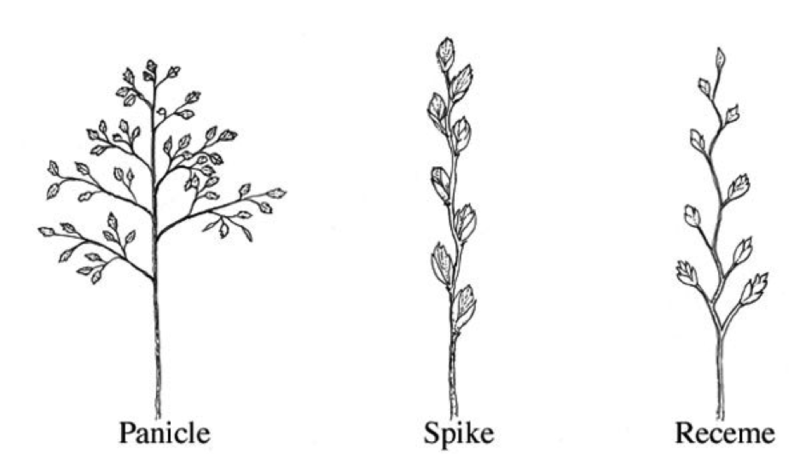 Seed heads can either be in the form of a panicle, spike or receme (see below). However, more often than not you will be trying to identify grasses that don’t have seed heads, so you need to use the physiology of their leaves and stem to tell them apart. 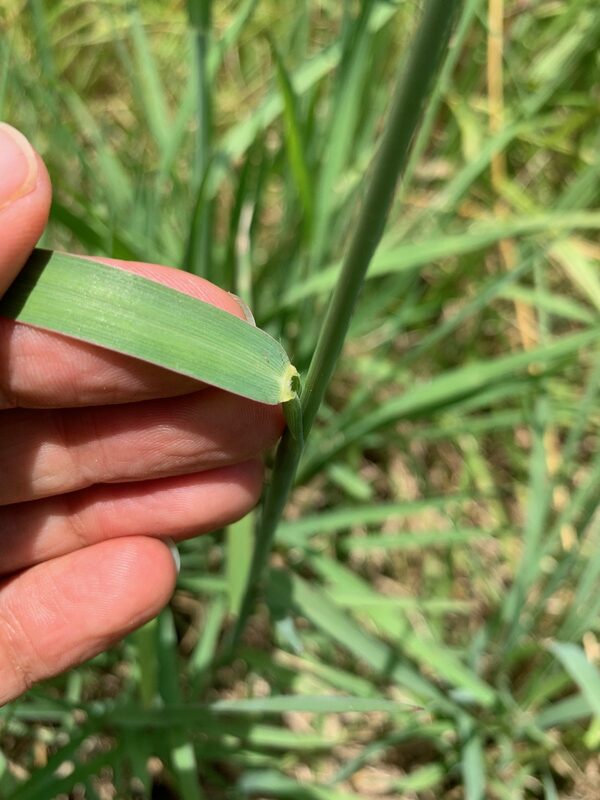 If seed heads are not present, you will need to use the structure of the leaf, auricle and ligule to identify your plants. These areas of the plant are shown in the photograph here. The first thing to look at with leaves is how the very youngest leaves are packaged within the shoot (called their ‘vernation’). 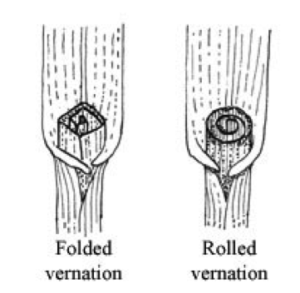 Leaves can either be folded, appearing V-shaped in the shoot or rolled and appearing rolled in the shoot. The diagram shows both structures. Next you should look at the leaf blades themselves. The blades can have one of a number of different ‘patterns’ in the veins. Some have one very dominant vein running down the centre of the leaf (Figure a below), others will have many equal sized veins (Figure b below). Others still have a dominant vein as well as smaller veins running in parallel. You also need to take note of how glossy or dull a leaf blade is and whether it has hairs on its upper and lower surface or not. Finally you should look at the tip of the leaf blade to see if it is ‘keeled’ or ‘flat and pointed’. 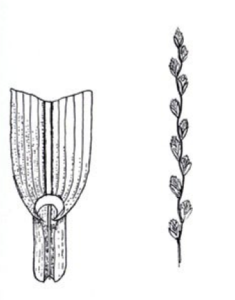 The diagram below shows some possible vein configurations and a keeled or flat and pointed leaf tip. 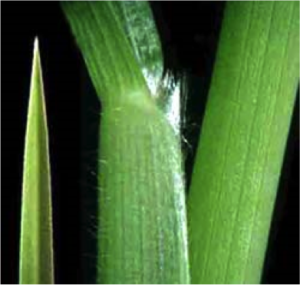 Ligules are located at the junction of the leaf blade and leaf sheath (see photo above) and can either be membranous (something like opaque cling-wrap), hairy structures or simply absent. 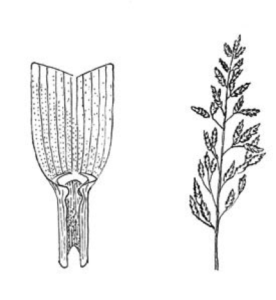 Auricles are extensions of the collar that is also located at the junction of the leaf blade and leaf sheath. Auricles can either be long and clasping, small and rudimentary or absent. 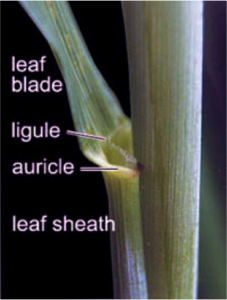 The various ligule and auricle structures can be seen below. The final piece of the puzzle is to look at how the plant actually grows. Does it grow in a clump or bunch? Does it send out underground runners called rhizomes to establish new plants or does it use above ground stolons to establish new plants. These 3 growth habits are shown below. 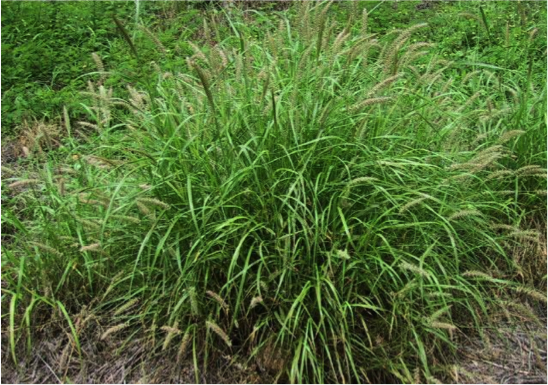 OK, crash course in identifying pasture plants is over; it is time for you to look at some grasses. 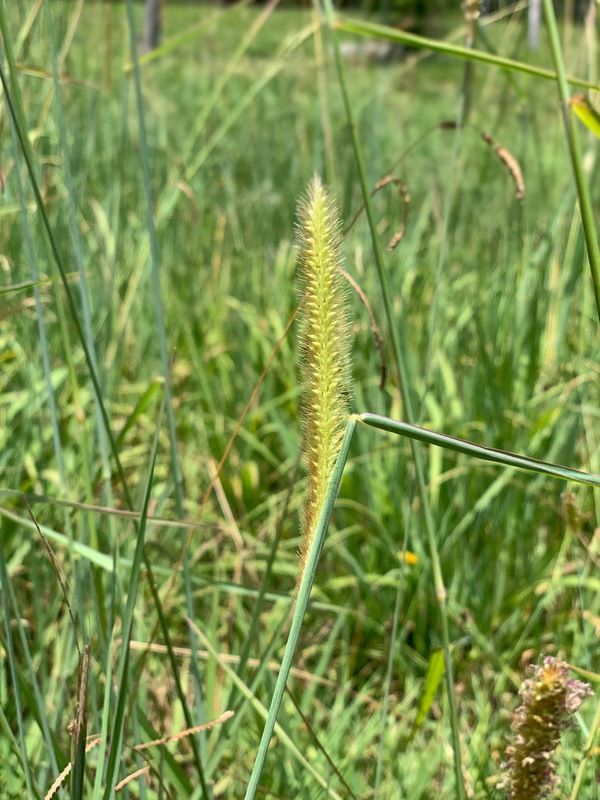 If you suspect you may have problems associated with ryegrass or tall fescue toxicity, take this Newsletter out into your pastures and see if any of the following grass profiles fit any of your grasses. 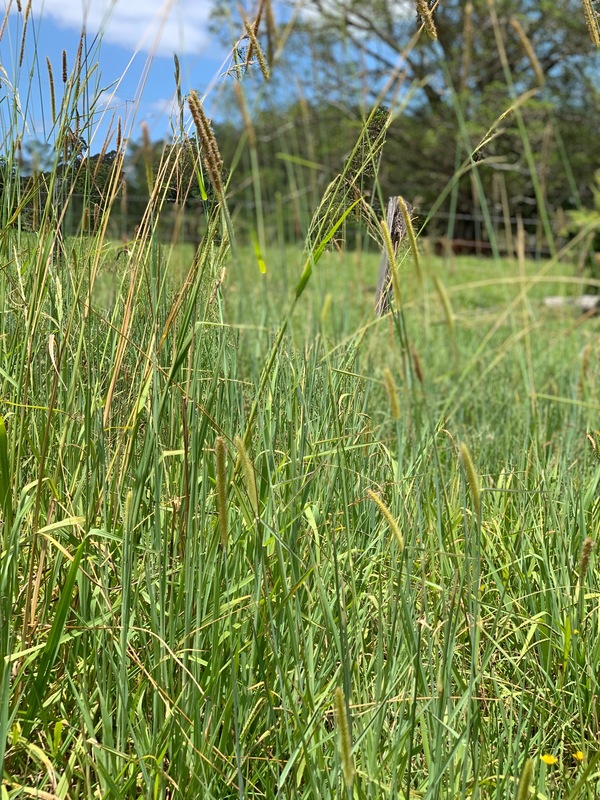 If you think you have these pastures but aren’t 100% sure, pot some of the plants you suspect are ryegrass or tall fescue and let them grow and go to seed. The seed head will help you to positively identify the species. If you have accurately identified that ryegrass and/or tall fescue are present in your pasture, this doesn’t necessarily mean that they are causing problems you may be observing as there are endophyte free varieties of both of these grasses and even endophyte infected grasses don’t always have levels of mycotoxin capable of causing issues, so you can’t jump to conclusions. One way to check if these grasses are causing your problems is to remove your horse completely from the pasture for 5 to 7 days and watch for signs of improvement. If the problems you were seeing go away or improve, and if putting your horse back out on pasture sees them return then it is possible they are the source of your problems. You can have your pastures tested for lolitrem B and ergovaline levels to confirm the presence of these toxins in your pasture sward. For details of laboratories who can run these analyses please email us at help@feedxl.com. 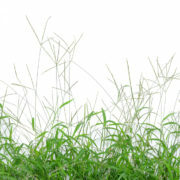 The purpose of this newsletter was to give you the information you need to identify these potentially problem grasses. Managing the toxicity caused by these pastures is too complex a topic to be covered in a short space here without doing it an injustice. Another newsletter will be written covering this topic in detail. In the meantime, if you need help, please go to the FeedXL Member Forums. 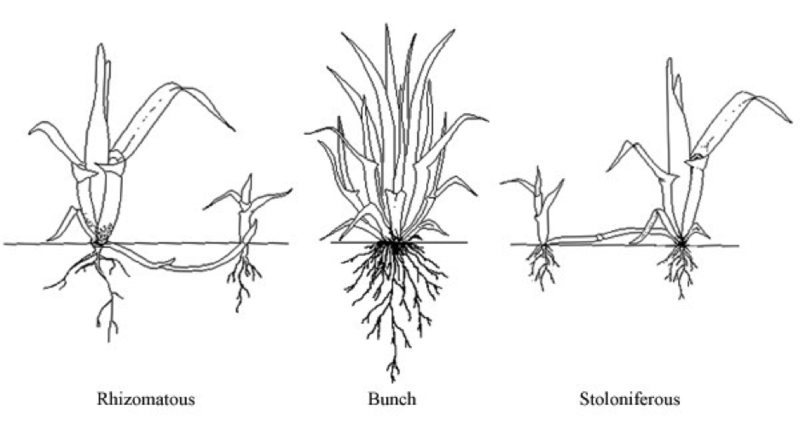 Diagrams and photos are from Penn State College of Agricultural Sciences and the Food And Agriculture Organisation. 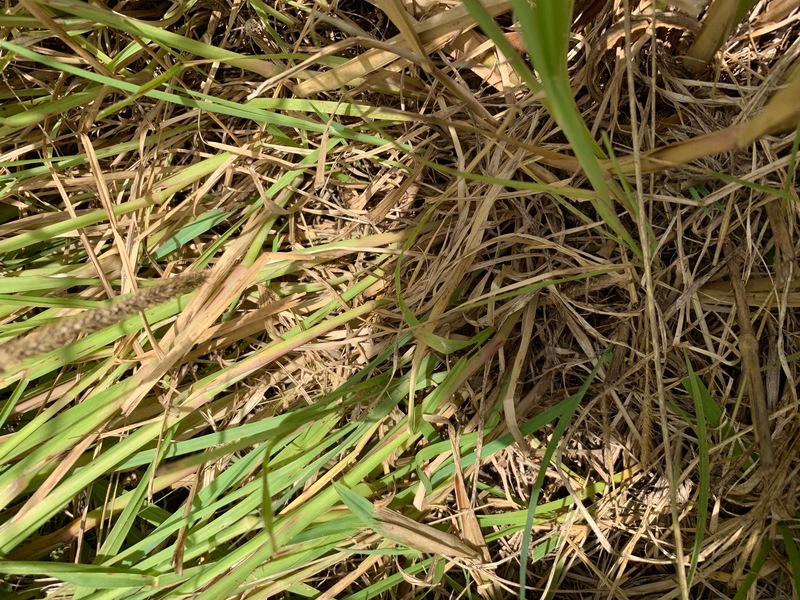 There are some useful photos of the leaves and seed heads of perennial ryegrass at http://pastureinfo.massey.ac.nz/grasspages/gperennialryegrass.html and and tall fescue at http://pastureinfo.massey.ac.nz/grasspages/gtallfescue.html. This newsletter by Dr. Nerida Richards was originally posted to the FeedXL user forums for FeedXL subscribers in October, 2010. If you would like to be among the first to receive our newsletters then please consider becoming a FeedXL member or subscribing to our email list. Use late summer and autumn while the temperatures are still comfortable and the pasture and hay quality still high to get your horse in good shape for winter. All horses during this period need to be fed a balanced diet (more on this soon) to make sure they are generally healthy and their immune systems fully functional. If your horse tends to lose weight over winter it can be fed a little more than normal during this time to get a bit of extra condition on them, so if they lose weight during winter they won’t end up being too skinny. You should also be looking to buy hay in summer as availability and quality are high but demand is lower meaning you will get a good quality product for less than you will pay in winter. Forage (hay, chaff and pasture) provides your horse with many of the calories they will need to maintain weight during winter. Aside from that, forage will keep your horse warm in winter. During the digestion of forages in the horse’s gut, bacteria ferment the fibrous portions. One of the ‘by-products’ of this fermentation is heat, and it is this heat that really helps a horse to stay warm during winter. Because of the ‘warming’ properties of forage, your horse will benefit more from an additional feed of hay than an extra feed of grain, pellets or sweetfeed in very wet, cold weather. Don’t throw a rug on your horse in winter and leave it on for weeks on end without taking it off to check your horse’s body condition (and of course that it doesn’t have any injuries or sores that are covered by the rug). Condition scoring involves looking at areas on your horse’s body such as the top of the neck, the wither, over the ribs and over the loin to assess the amount of body fat (which we call body condition) your horse is carrying. For more information on Body Condition Scoring, see the FeedXL Newsletter #1. At the very least, take your horse’s rug off every week so you can check to see if your horse is losing, maintaining or gaining weight. Because you will be condition scoring your horse regularly you will know if your horse is maintaining, gaining or losing weight. Depending on what you want your horse to be doing, you may need to adjust the diet to keep your horse at the bodyweight and condition you want. Feeding more hay and if you’re not already doing so feeding some lucerne hay. Adding high energy feeds to the diet like pellets, sweetfeeds, oil or high energy fibres like soybean hulls, copra meal or sugarbeet pulp. Use the best quality feeds you can afford and if using a sweetfeed look for one that contains either extruded or micronised grains as these are more digestible for horses. While traditionally, knowing if what you were feeding was meeting your horse’s requirements was quite hard, the FeedXL Nutrition Software makes it very easy to see if what you are feeding is the right thing for your horse. FeedXL will also help you manage your horse’s bodyweight. For horses susceptible to laminitis (including overweight horses, horses with Cushing’s Disease or those who have previously had laminitis) winter can be a danger period. Restrict your horse’s access to pasture to only the very early hours of the morning up until 11 am. Feed low sugar hay and avoid hays made from ryegrass or cereals like oats or wheat. Avoid all feeds with grain or grain by-products in them. Beware: Most feeds that claim to be grain free are NOT. Read the label of all feeds carefully. If they contain anything like bran, pollard, millmix or millrun do not feed them to a horse prone to laminitis. By ticking the ‘Laminitis’ box on your horse’s details page in FeedXL, all of the unsuitable feeds that contain grains or grain by-products will be coloured red and you will be warned not to use them. 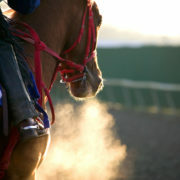 A horse’s coat can become dry and dull during winter. To help keep the coat and skin healthy, add 1/4 cup of oil to the diet. Of course all the normal rules of good horse husbandry apply in winter. Feeding a well balanced diet in conjunction with good dental, hoof and veterinary care as well as a strict worming regime will help keep your horses in top shape over winter. This newsletter by Dr. Nerida Richards was originally posted to the FeedXL user forums for FeedXL subscribers in May, 2009. If you would like to be among the first to receive our newsletters then please consider becoming a FeedXL member or subscribing to our email list.